Ten long years after the release of ‘Acid King III’ this influential doom behemoth is finally back and better than ever. They may not have found time to get back in the studio over the last decade, but, led as ever by singer/guitarist Lori S, the San Francisco-based band remain fiercely committed to doing things their own way. “A little moodier” is something of an understatement. Written in 2013, these songs are expansive and emotional. They weave and flow like a mighty river, with smaller tributaries bringing new colours and debris into the swirling dark current. One of the doom scene’s true originals, Acid King are still dong the business, and their ability to remain fresh and original with the framework of slow ‘n’ heavy music is extraordinary. Not many bands could pull off ‘Silent Pictures’, for example. With its droning monotony, this song could drown lesser talents, but such is Acid King’s charisma that it is utterly absorbing throughout its nine-minute lifespan. The same is true of ‘Red River’, a heavenly trudge… and in fact of pretty much every minute on this fantastic album. The band’s charisma, which has remained constant throughout various changes of bass player down the years, is based on a potent musical chemistry. It’s inspired by Lori’s ridiculously awesome music and tones, bolstered by Joey Osbourne’s enthralling drum work and underpinned by Mark Lamb’s explosive bass. All of the instruments bustle and hum with energy, and they’re clear and alive in the mix (which should always be the case on any album, but frequently isn’t). Acid King’s riffs are beautiful, a class apart. And they are brought to life by Lori’s bold, hypnotic vocal melodies. At times, it’s a perfect mix. It’s been ten years since the last album, but ‘Middle Of Nowhere, Center Of Everywhere’ is so good that it’s made the long wait worthwhile. 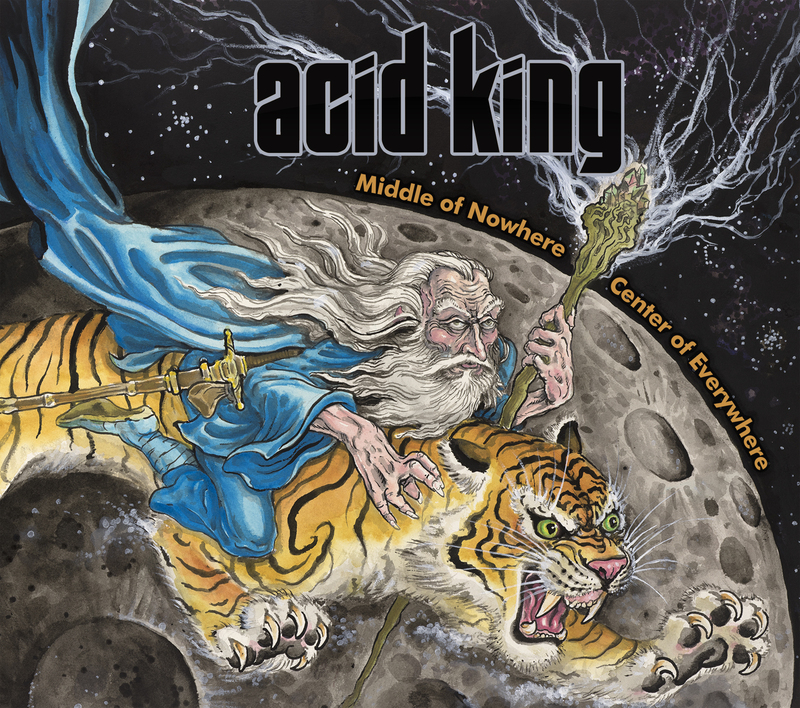 This entry was posted in REVIEWS and tagged 2015, Acid King, Album review, centre of everywhere, middle of nowhere, Svart Records. Bookmark the permalink. How did you review this if it’s not out yet? o: Regardless, now I’m pretty interested in these guys.